By now you will doubtless be familiar with my love of ghosts. So it will come as no surprise to know that I leapt at the opportunity to go to a ghost story reading. I was even more excited by the fact that the stories were those by none other than my favourite ghostly author, M R James. James’s Ghost Stories of an Antiquary is one of my bookshelf essentials. So I was simply quivering with anticipation from the day I was invited by my long-suffering best friend right up until the house lights went down and Robert Lloyd Parry took his place at the front of the audience. 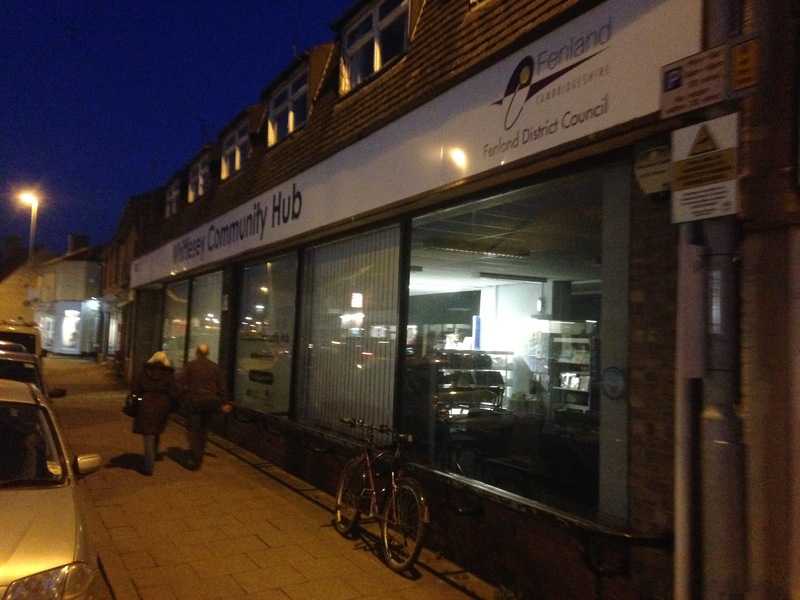 The setting itself was less than spooky, a 20th century community building in the heart of a fenland market town, but the Arts Alive team had done a great job of creating a certain ghostly ambiance. The lights were dimmed, the audience assembled around a single high backed chair, nestled cosily next to a small wooden table topped with a decanter of ‘whisky’, several ageing leather backed books, a handful of old photographs and some other dusty artefacts. For those of you who are unfamiliar with M R James, there are so many reasons why you absolutely need to get hold of and read some of his short ghostly stories (I recommend to the highest degree possible Oh, Whistle, And I’ll Come To You, My Lad). James is nothing short of a master of the ghost story. His stories specialise in circumstance and the terrible events which can emerge from ignorant mortals meddling in the unknown. His writing is subtle, focusing on the small details; shadows, the voices of madmen and figures glimpsed out the corner of your eye. Like all great gothic writers, James allows his readers to create their own ghosts, existing only in their minds, and never once flitting across the parchment. Robert Lloyd Parry did a stunning job donning M R James’s persona. The mind boggles at how he was able to reel off a 90 minute performance with such ease, never stumbling over his words or seeming to pause for thought. He expertly assumed not just James but each of his characters, never flinching or breaking character even for a second. The first story – Casting The Runes – threw the audience back to 1903, and began by with the reading of a collection of letters. The letters informed an unknown character that a draft paper submitted for publishing in a programme was not to be included. These seemingly innocent notes paved the way for a series of strange and ghostly events including vanishing tram adverts, mysterious roadside leafleters, and unknown furry creatures lurking beneath bedclothes, all linked together by the passing of a cursed script. Parry told the story with remarkable ease, barely glancing even once at the audience, and framing the tale from multiple points of view. When he came to the end of the first story, Parry rose from his chair for the first time and silently swept from the room, leaving the audience alone and awestruck. The house lights came up and we were able to mull about for a short time, enjoying a reasonably priced drink from the charity bar and discussing the past 45 minutes. 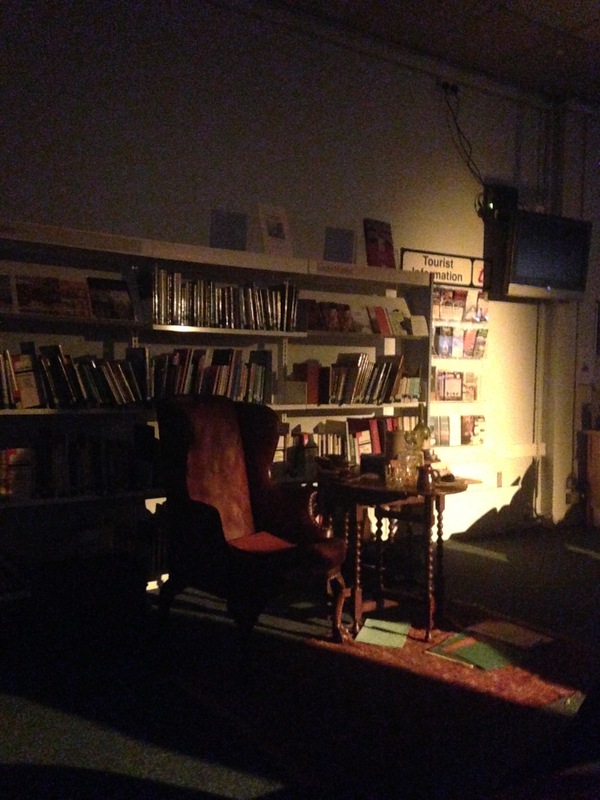 I was delighted to find that my other half – who before the event reported that he was ‘livid’ at my forcing him to come along to a ghost story reading – had thoroughly enjoyed the performance thus far. As, it seemed, had everyone else. 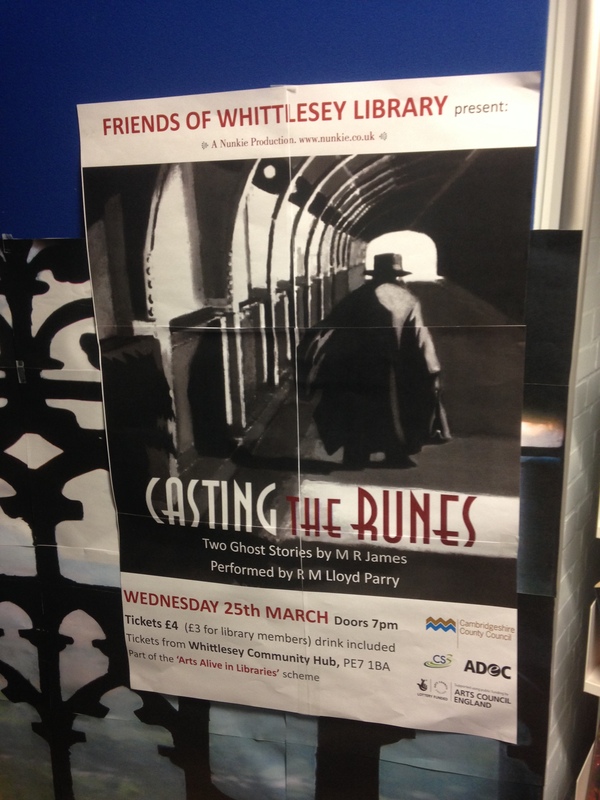 I’d spent so long raving about M R James in the days running up to this event that I will confess to having been being slightly nervous that the performance would be met with anything other than pure wonderment. After a short interval the house lights went down, and we were quickly ushered back to our seats. Parry once more slipped into his seat and immediately transformed once again into the evenings faithful host. The second tale – The Residence of Whitminster – which was in equal parts mesmerising and chilling, was an 18th century tale of the supernatural destruction of a Whitminster residence, beginning with the arrival of a gaunt young man, the disappearance of a jet black cockerel named Hannibal and the feverish rants of a distressed child. Parry assumed the persona of no less than eight characters, slipping seamlessly from one side of a conversation to another, in a performance which had the eyes of the audience glued to his every move. I was overwhelmed by Parry’s performance; I went to the event as a lover of all things M R James, and was delighted that one man managed to do his work so much justice. The most remarkable thing about the event is one I am not sure I can adequately put into words. I could compare Parry’s performance to the alcohol induced ramblings of an ancient figure propped against the bar of a public house; a one way conversation with a compulsive storyteller; or the confession of one whose secrets have been kept for too long. The event, I feel, is something you will have to see for yourself in order to fully appreciate it. One of the ladies in charge of Arts Alive said that the events had been very well received, and I can see why. 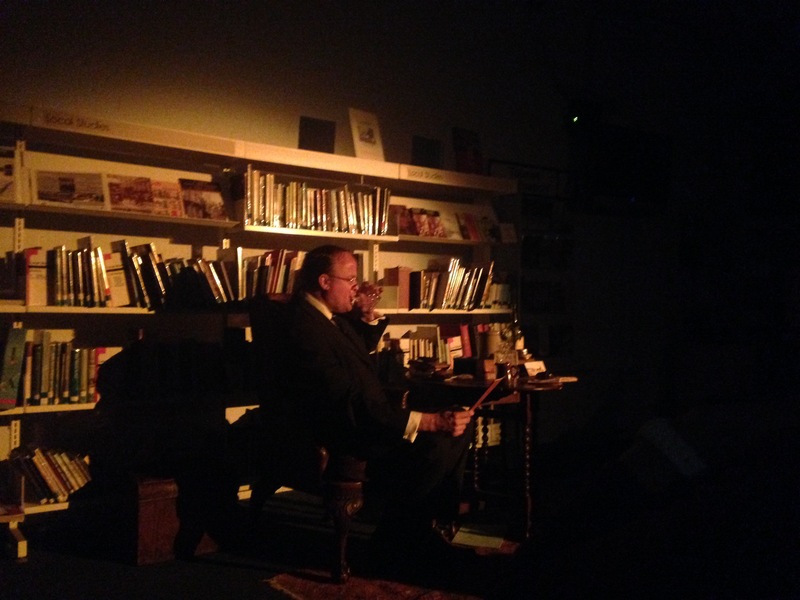 Lovers of ghost stories, fans of M R James, and those who were even slightly intrigued by the beginning of this review, I urge you look and see if Robert Lloyd Parry is performing in a library near you.